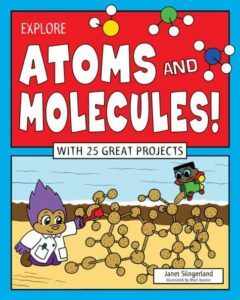 I had a lot of fun writing this book and coming up with activities that explore atoms and molecules. I suspect my family was happy when I was done and got my experiments off the kitchen counter. I hope you have as much fun with this book as I did (and learn a little bit about the building blocks of the Universe along the way). If you want to explore atoms and molecules even more, check out the web sites below. 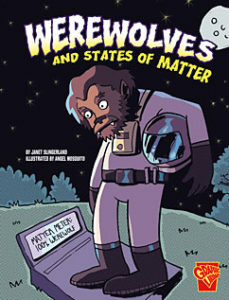 What can werewolves teach us about the states of matter? Check out this graphic novel style science book to find out. My alma mater, Rensselaer Polytechnic Institute, has a website called the Molecularium with various movies, games, and animations that explore atoms and molecules. I believe this site is geared for students in grades 4-8. MIT's Edgerton Center has a set of activities that help students ages 11 and up learn about atoms and molecules using LEGO bricks. Check it out here. Keith Enevoldsen has a great site with lots of different views of the periodic table, element cards, and other resources that help you take a closer look at each of the elements. Check it out. If you are interested in learning more about the history of the periodic table came about, check out the Science History Institute. To learn more about Niels Bohr and his atomic model (and to see old pictures of him, J.J. Thomson, and Ernest Rutherford), check out the Niels Bohr Institute. And just for fun, check out The Periodic Table of Comic Books to see which comic book pages have highlighted chemical elements. Science Kids has a bunch of games related to the states of matter, properties of materials, chemical reactions and more. They are collected in the section labeled, "Solids, Liquids, & Gases." For hands-on activities, check out the American Chemical Society's page on Solids, Liquids, & Gases. Harcourt has a nice virtual representation of what molecules look like in solids, liquids, and gases. Idaho Public Television has a bunch of online games related to the States of Matter.